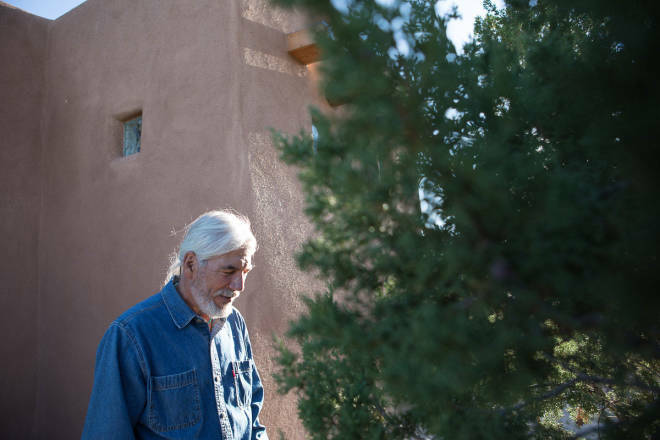 Above: Author Dan Flores outside his New Mexico home. UNLESS WILE E. COYOTE’S unrequited obsession with the Road Runner strikes you as a psychologically healthy pursuit, this is not a normal story. It’s slightly embarrassing, in fact, in a way that single-minded passions can be, particularly ones engaged in over decades. Admit to friends at age 50 that you still carry a torch for the girl you took to the high school prom and you’ll get sympathetic chuckles. Then tell them that you’ve abandoned relationship after relationship thanks to brief memories of that girl and see how they react. 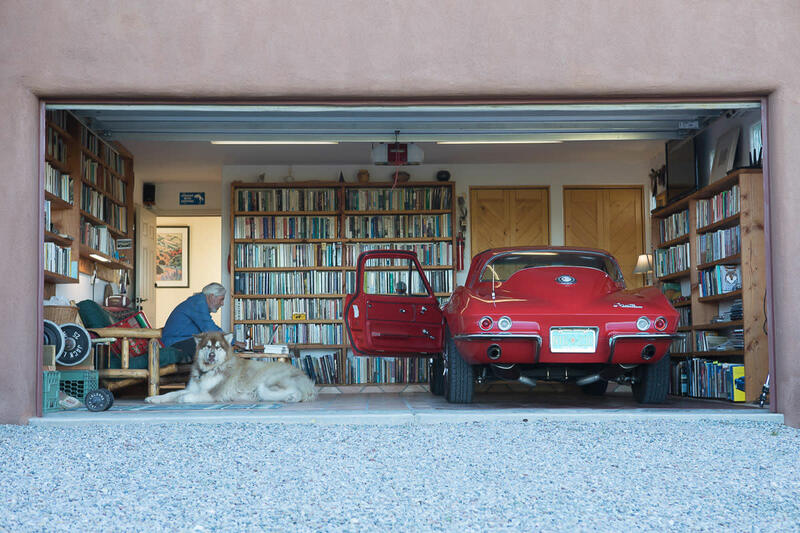 My pursuit of getting to live in New Mexico—and, I should be specific, in Santa Fe—has that same whiff of obsessive-compulsive behavior. But being a little psychologically off-center finally got me to what I like to call my Best Place, one I’d been chasing for 40 years. I am pretty certain that I didn’t target the state as some dream destination as a child. My upbringing was in another old American place, Louisiana, where ancestors of mine go back eight generations to the founding of the first European towns in the early 1700s. I mark it as a compass reading in my own life, though, that the founders of the old Louisiana city of Natchitoches, where my ancestors landed, chose the site of their settlement because French settlers believed it was on the route to Santa Fe. Which means that even in early-1700s Louisiana, Santa Fe was already a legendary destination. Coming of age in 1960s Louisiana, I began to think that maybe 250 years down the timeline, my genes had blotted up some of that old colonial fascination. For certain, something, a draw that seemed downright mysterious when I was 12 or 13, had me poring through the World Book Encyclopedia for stories and images of the West. Somehow a kid raised to the moist and the verdant couldn’t stop thinking of sere, minimalist, rocky places—in short, deserts. There was even a recurring dream in my childhood, not of flying or being pursued by monsters—nothing so normal—but a landscape dream, a vivid mental image of soaring red cliffs under cobalt blue, with clouds like cotton balls stretching into infinity and, pervading all, a sense of … adventure! Louisiana happened to be one of those places in America where a sensitive kid could feel that, just beyond eyesight, just beyond the curve of the western horizon, nature started to change. That urge to “see over the curve” as a teenager sent me on long weekend drives to the edge of the West. Even today I can conjure the excitement of watching the country lose its trees and, when night fell, seeing the lights of towns 30 miles away. Westward, there were familiar stars and planets in the night skies, but they looked polished, enlarged, intensely vivid. Even the nights seemed to draw me toward the sunset. Genetic memory had to be the explanation. My Louisiana ancestors had traded for furs and horses with the Indians up the Red River, and, I decided, they must have bequeathed to me a genetic predilection for the West. By my early twenties, the pull of the West had gotten me a couple of weeks in Colorado, a summer in Wyoming, and epic, Kerouac-like road trips with simpatico friends to California, Utah, Idaho, Montana, the Pacific Northwest, Alaska, the Yukon, and the Arctic Circle. We camped, read the local books, saw wolves and bears and glaciers and cities. And as I’d done when helping build cabins in the woods as a kid, I subconsciously evaluated them as potential places I might someday inhabit. Through all of these explorations, I had only glanced off New Mexico’s edges. But in graduate school in Texas, professors spoke over beers, with great conviction, about a part of the West I had yet to see. So in the summer of 1976, a friend and I took a road trip to Taos and Santa Fe, a tourist junket I still remember because I sold a travel piece about it to a national magazine. It’s evident that I marveled at the settings of these New Mexico towns, at the magical juxtaposition of desert and mountain, at landscapes that spoke to me. The piece I wrote also makes it clear: I was stunned at first sight with the sensuous stucco/adobe architecture of northern New Mexico. By comparison, California’s Spanish Colonial style seemed hard-edged and not nearly so exotic. And I’d never experienced the kind of sun-drenched, diamond-clear light I walked through on the Plaza in Santa Fe. I was smitten. Not that my take was especially deep or intellectual, but this trip added a nuance to my genetic-predisposition theory. Eight generations back, a Spanish ancestor had been absorbed into French Louisiana. Maybe the West was drawing me for wholly new reasons I hadn’t thought of before. TWO YEARS LATER, as the fall semester approached, I had a PhD but no university job. That disconcerting state was an obvious recipe for another road trip, so I spent August of 1978 driving the Southwest, sitting around campfires, mulling my fate. In a moment reminiscent of a scene from Easy Rider, down some long-forgotten two-track in southern Utah, I had an epiphany: No job prospect meant I could live the hell where I wanted to live and end up in the Best Place I’d found so far. The next day, I drove to Santa Fe, rented a room above the Jean Cocteau theater, paid a deposit and two months’ rent, and headed home to clear out my grad-student pad. For the next 14 years, Santa Fe and northern New Mexico were less than 350 miles away. On many long weekends, I got to be the quintessential Texas tourist, staying at the Santa Fe Motel, walking to the Plaza, trying out the restaurants, and looking for (and occasionally spotting) movie stars. Or hiking Ghost Ranch or the Río Grande Gorge. Or driving the roads out from the city and imagining where I might live. Like lots of other young men who couldn’t move to Santa Fe in the 1980s but visited regularly, I discovered, among other things, that this romantic city, with its thick, orange evening light and moonlit streets, was a winner of a place to bring a girl for the weekend. But at the end of three days, or five, I was always leaving. I did manage to wrangle the entire summer of 1983 in a rental on Agua Fria Road to finish my first book, Jefferson and Southwestern Exploration: The Freeman & Custis Accounts of the Red River Expedition of 1806. Dave’s famous green chile burgers were just around the corner. It was a superlative summer. But once again, that August, I had to leave. Endlessly departing was never easy. Eventually I sought out a piece of ground in Texas’ Yellow House Canyon, the most New Mexico–looking landscape I could find near my university town. One of the original members of the Flatlanders band had started a house on it, which I eventually finished as a Pueblo Revival home, with the help of friends who knew Southwest construction. We even made adobe bricks in the yard. At an event in Santa Fe for a book I wrote about West Texas, a bookstore owner asked, “You live here, right?” Her reaction when I confessed my actual city of residence has been a touchstone ever since: “Oh, my God, ghastly place!” But at least my Texas home had vigas, kiva fireplaces, brown stucco, and a mesa that, on my birthday, the rising sun bisected precisely. If I couldn’t have New Mexico, I could import it. Still, Santa Fe was about to recede to a greater distance. In the early 1990s, the flagship state university in Montana offered me a fancy professorship if I would move to Missoula, a New West town set in the knot of the northern Rocky Mountains. Everything about it was intriguing. Missoula sat atop many people’s Best Place lists and boasted a large and well-known writers’ colony. Now I was 1,000 miles from Santa Fe, in a place with many alluring features. But it was still difficult to stay away from northern New Mexico. In fact, I got down often enough that a girlfriend and I spent the change of the millennium in Mabel and Tony Luhan’s house in Taos. We slept in Mabel’s bed so that I could read aloud (in an effort to conjure her ghost) passages I’d written about her in a book I’d just finished writing. Composed in the blue-green world of the northern Rocky Mountains, Horizontal Yellow was another book about … the Southwest. Thoreau’s dictum about resting one foot in nature and the other in civilization led me to buy land in the foothills of the Bitterroot Valley, south of Missoula, and create a small ranch from the ground up. Having experienced life in a Pueblo Revival home, there was no way I was going to live in the plastic-sided stick houses common in Montana. A log home appealed but seemed awfully dark in the dim Montana winter. It turned out one of the first American structures ever built in Bitterroot, a fur trader’s post, was a stuccoed adobe. Tradition enough for me. Through much of the 1990s, I spent summers building myself a flowing, organic, solar-powered Santa Fe–style house, a demonstrably crazy idea in Montana, since it meant importing every corbel, saltillo tile, and bag of finish stucco. It did get me a break on fire insurance, though. BY THE TIME I was close to finishing my Montana house and ranch, an inescapable truth arose. I loved Montana, wrote a book about it, but obviously wanted to be in northern New Mexico. So in 2000, after a yearlong search, I bought land on the south rim of the Galisteo Basin, 17 miles outside Santa Fe. Two years later I built, on its best overlook, a U-shaped Pueblo Revival house, a stylized version of Georgia O’Keeffe’s Ghost Ranch home. I had another dozen years to go before I could retire to live full-time on the outskirts of Santa Fe. That happened in 2014—36 years after I first tried to move to Santa Fe. I’ll admit I’m not doing what my fellow writers Bill deBuys and Stanley Crawford have done, adapting to life in ancient Spanish villages. My area was settled by miners from Colorado in the 1880s. Almost all my neighbors are, like me, migrants from somewhere else. So it is fair to ask of us new arrivals: Of all the Best Places in the world, why this one? I’m not sure my answers are unique. Where deserts and plains meet the Rockies at a general elevation of 7,000 feet, atmospherics dazzle. Crystalline air enables sharp-edged far-seeing. There’s the famous Southwestern sunshine, a given in every tourist promotional pamphlet. It sounds like hype, but in a low-humidity setting slow-roasted in piñon and juniper fragrances, none of it is. What else? Well, I write a good bit about history, so I confess I adore its depths in a 400-year-old city. Visible a couple of miles away out my front door is a 1,000-year-old turquoise mine. The remains of Puebloan villages from centuries ago dot the countryside. No place in this country conveys so forcefully a sense that America is not “new” but is an ancient human place, a needed corrective for citizens of the United States. Let’s not overlook the daily reality in Santa Fe. A city immersed in art inspires, as does being enveloped by a distinctively North American architecture, the only American architecture even partially based on indigenous building. Even first-time visitors talk about the stimulating multiculturalism of Santa Fe. Getting to dress any damned way you please is a delight, a generosity that my wife, Sara, relishes. The outdoor café culture is another sensuous perk. Santa Fe may not be Paris, but wine and cheese at an outdoor table here works a similar magic. So does tequila. For me, getting to have almost every one of the grand landforms of the West—the Rockies, the Southwestern deserts, the red cliffs of the Colorado Plateau, and the horizontal yellow sweeps of the Great Plains—within an hour’s drive is remarkable. Having that varied a playground, brought to you by the sacred system of public lands in the West, may be the biggest perk of all. Sitting on my portal looking across the pointillist stippling of piñons and junipers, I no longer wonder whether I’m here as a result of ancestral imprinting. In my twenties, that was a pleasing fiction, but the truth turned out to be a little more prosaic than fur-trader genetic memory. A few years back, at a reunion in Louisiana, an aunt reminded me of a reality I had entirely forgotten. At barely four years old, I had been taken on a family vacation to Carlsbad Caverns. Somewhere on the route, we must have seen that landscape, so utterly unlike the bayous and bald cypress settings of home, and it loaded my subconscious with a dream that led to Santa Fe.